Products commonly used to treat fleas and ticks, including spot-on treatments, collars, sprays, and foggers, contain toxic pesticides that can easily spread around your home. Toxic pesticides from these treatments can also end up in our local waterways when you: wash your pet; wash bedding, clothing, floors, carpets or upholstery that comes into contact with your pet; and neglect to dispose of pet waste in the trash. To avoid exposing your pets, family and Bay Area waterways to toxic pesticides, please speak to your vet about using oral medications to control fleas and ticks, and review our recommendations for keeping your pets safe. 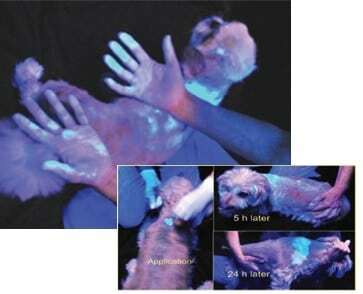 In a 2012 study, researchers monitored homes for a month after using a topical pet treatment and incorporated a fluorescent dye into the spot treatment to photograph the spread.